Luxury motor yachts like the new Maritimo M65 are made to cross oceans. It is hard to imagine where Australian luxury motor yachts builder Maritimo will go from here, having arrived at the gates of perfection with its stunning new Maritimo M65. The M65 is a triumph – an extremely capable performance cruiser with the pedigree and build to cross oceans safely, yet offers the contemporary styling of a city apartment where the emphasis is on easy living and understated elegance. The Maritimo M65 is not showy, nor gaudy in its detail. It leans towards classic luxury motor yachts, with an exterior design shaped around the demands of practicality and safety, the essential hallmarks of a genuine oceangoing vessel. This is a motor yacht that blurs the line between ship and cruiser. While ship-like with its high bulwarks and walkaround decks and its redundancy of critical systems and long-range reserves, this cruiser still presents an interior that is superbly practical, yet modern and stylish with an exceptional level of finish and detail. The Maritimo M65 is a masterstroke and something much greater than the sum of its parts. 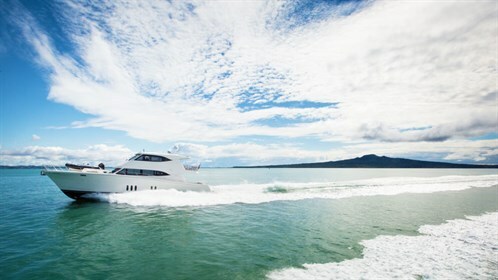 It represents a Herculean leap over the Maritimo M60 that it replaces and reinforces the Queensland builder’s reputation as an innovator in the world of luxury motoryachts. A standout at the recent Auckland On Water Boat Show, it is worth noting that this Maritimo M65 crossed the Tasman on her own keel in a shade over four days, averaging 12kts in a predominantly fresh westerly breeze and a three to four-metre quartering sea. 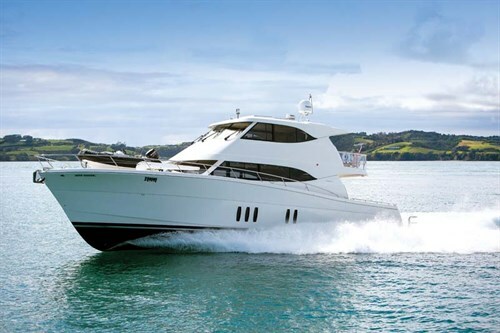 Long-serving Maritimo yachts test skipper Russell Fleming guided the M65 to NZ and declared the yacht had not only performed faultlessly but had proved to be extremely sea-kindly, comfortable and dry, and singled out the 900hp Scania diesels as contributors to onboard comfort. Browse our archive of Maritimo motor yacht reviews. The Maritimo M65 show boat is hull #3 and owned by company principal Bill Barry-Cotter. 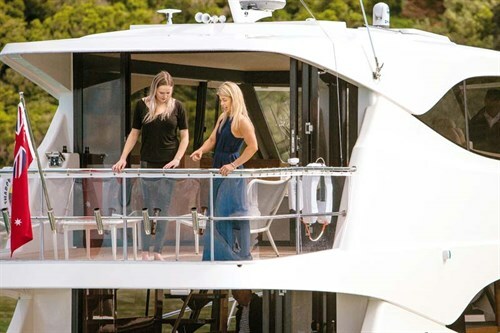 The boat has performed a dual role of private yacht and demonstrator, featuring at both the Sanctuary Cove and Sydney shows. 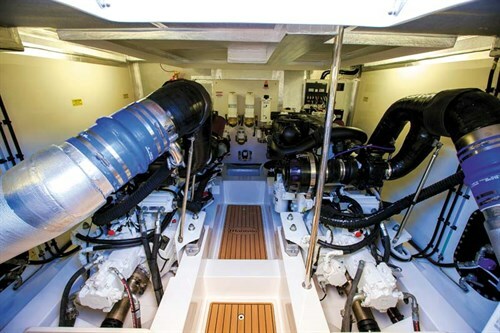 It is the first Maritimo M65 fitted with the 16.0lt Scania marine diesel power plants which, given their efficiency and performance, are now offered as the factory specification engine, replacing the 900hp Volvo Penta D13s. Alternative options include the larger 1200hp Caterpillar C18s and MAN marine diesel engines. Barry-Cotter’s preference for the Scania lies in its superior efficiency at cruising revs and its continuous industrial rating which is reflected in the engine’s 500-hour servicing schedule. Even from new, the first service does not fall due for 500 hours and requires less than $50 in servicing consumables. What’s more, the Scania DI16 072M engines give nothing away in performance to the larger options, propelling the 36,000kg (dry) M65 to a shade under 27kts at WOT. The twin-turbo engines feature wet-liners with individual cylinder heads and four-valve-per-cylinder technology. This promotes easy reparability and cylinder head overhaul should it ever be necessary. This is a primary contributor to Scania’s top-of-its-class fuel efficiency and type-approval with all major classification societies. The M65’s engineering is nothing if not robust. The attention to detail lavished on its systems is evident at every turn and reflects the builder’s vast experience and uncompromising approach to quality. Systems redundancy features highly in critical areas and might best be described as a "belt and braces" approach. Longevity and reliability come at a price and in this regard buyers need not worry about being short-changed. With three boats on the water and six more on order, it’s clear the M65 has been an unmitigated success for Maritimo. More than any other, the M65 reinforces the adage that if you build it the people will come. Launching such an ambitious design project carries risks, but the success that has followed reconfirms Barry-Cotter’s uncanny ability to read the market and deliver on desire. This does not happen by chance. It happens by engaging with your audience and listening with both ears. The M65 is the product of considerable input from Maritimo owners – those best-placed to drive innovation and change and this have made the M65 the most successful launch yet. 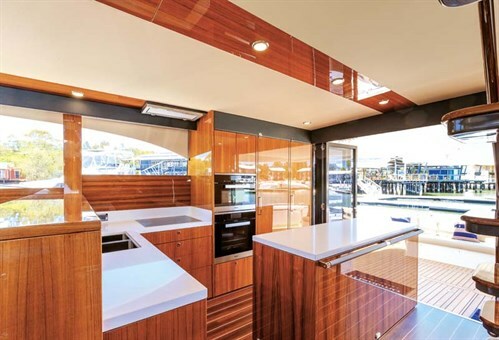 At something over $A3.5 million as seen here, Maritimo M65 buyers could reasonably expect to have a hand in the look and finish of their boat and in this regard the options are limited only by imagination. Interestingly, however, buyers have not wavered too far from the M65’s standard specification save for aesthetic considerations. This speaks volumes for the boat’s clever design and effective use of every inch of available space. The Maritimo M65’s sheer physicality is imposing when viewed dockside, and handling and manoeuvrability are considerations that cannot be avoided. The large flat sections of the superstructure that tower over the M65’s expansive footprint create unavoidable windage that will need careful management in tight spaces. That said, the bow and stern thrusters are appropriately sized and offer remote functionality from the walkaround deck. Manoeuvring, as skipper Fleming puts it, is largely a case of mind over matter. It might look daunting but it need not be and those familiar operating the M48 and M60 should experience no difficulty. The extra length in the Maritimo M65 hull has allowed Maritimo to build ever higher and yet retain a stylish sweptback look to the superstructure. Combined with the subtle deck sheer aft, this culminates in arguably a sweeter looking motoryacht than its moulded-wing predecessors. The Maritimo M65 exterior styling moves away somewhat from the more curvaceous European-influence seen on earlier Maritimos. This new offering is a more purposeful and powerful-looking boat with its flush cabin sides, massive foredeck and acres of beautiful quartersawn teak laid in the cockpit and aft boarding platform. In a vessel of this size and quality it is challenging to capture the real essence of the interior in words. It is a visual symphony where nothing is quite as it seems. The harder you look the greater the detail becomes, such as: the faultless off-the-gun mirror-gloss finish of the teak cabinetry and bulkheads, the soldier-straight stitching of the many leather accent panels and the sophisticated LED lighting secreted away under saloon bunk fronts and window pelmets. Everything is picture perfect. For all of this, the Maritimo M65 is inviting and homely. It begs to be enjoyed. There is none of the pretence that makes some of this calibre stiff and formal. Barry-Cotter’s aim was to create a home away from home and he has done just that. The gravitational pull within the M65 is surely the big skylounge which is a world within itself. From here you can kick back on the electronically-controlled chaise lounge port of the helm station and chat with the skipper or simply take in the view. Behind, the skylounge runs aft to a private balcony where table and chairs provide the perfect platform for a spot of evening stargazing when the anchor is down. With the volume of a modern 40-footer, the skylounge can be configured to provide a completely independent living space with self-contained galley and bar – an ideal solution for extended family cruising. 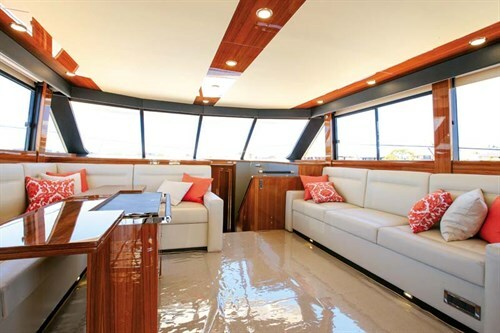 In our example the emphasis was on group entertaining and you’ll find an aft wetbar and entertainment centre to port, flanked with a beautiful bi-fold teak table and L-shaped leather settee. Equipped with reverse-cycle air-con, large electric moonroof, side-opening windows and full-height bi-fold doors opening onto the aft deck, comfort options abound and reinforce the M65 as a boat for all seasons. The helm station is front and to starboard and set around a bank of three big multifunction Simrad displays mounted in the dash. FLIR night-vision comes standard and CCTV cameras in the engineroom, cockpit and accommodation areas give the skipper eyes in the back of his head. The single helm and passenger seats are finished in leather and provide excellent support and comfort, the skipper’s being electronically-operated. Three independent rain-sensing wipers keep the view clear ahead and Scania Engine Management System digital readouts are clear and detailed. The M65 has three sets of engine remotes: at the bridge, aft on the skylounge deck and in the cockpit. The big Maritimo is equipped with twin self-launching 20kW Onan generators, a 130lt/h Indromar watermaker and very generous tankage that runs to 6000lt for fuel, 1400lt for water and two 200lt holding tanks. An additional 1800lt fuel tank is a tick-box option. The onboard systems are 24V DC. All AC and DC breakers are from BEP Marine and housed in a dedicated switch room located at the foot of the flybridge stairs. There is a 4kW inverter charger and 100amp battery charger for shorepower. Descending the internal staircase – an artwork in its own right – you arrive just inside the rear saloon doors that open onto the expansive cockpit. True to tradition, the galley is the heart and soul of the M65 and a central hub to which guests will be irresistibly drawn. The layout positively encourages this, with bar stool leaners lined up behind the galley counter. Set around a stone-topped island servery, the galley offers every conceivable convenience and extra. This includes a domestic-style double-door fridge-freezer and the latest Miele appliances including four-burner cooktop, two-speed convection microwave, plate warmer, rangehood and under-bench dishwasher. Opposite to port is a complementary wetbar complete with built-in wine cooler, icemaker and cocktail cabinet. This is also the nerve centre for the latest in onboard entertainment – but secreted away under the internal flybridge staircase. The mid-ship saloon is centred on a magnificent solid, folding teak dining table with full plate and cutlery racks built within. 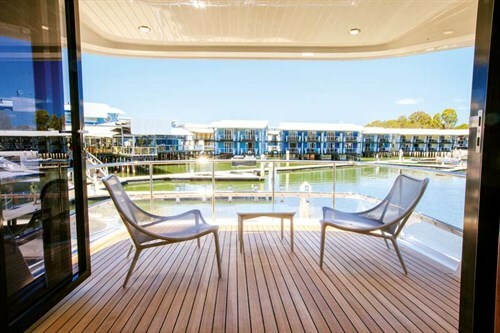 Set on port alongside a large L-shaped lounger, formal dining for eight is not only achievable but comfortable with the addition of occasional folding chairs. Opposite to port is a second lounge which doubles as a sofa bed when required. The accommodation on the new Maritimo M65 is a giant leap on previous models and presents a level of finish and refinement becoming of a superyacht. A full-beam master isn’t a new concept, but the extra volume of the M65 has propelled this suite to superstar status. 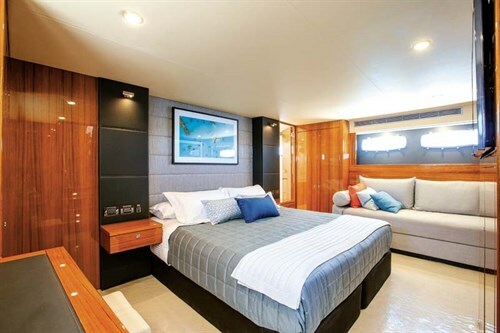 What is new is the full-beam master en suite hidden behind the king-size bed and entered from the starboard side. A magnificent addition, it features a multi-jet shower, his-and-hers vanities and million-dollar views through opening windows in the topsides. The master itself is larger than many domestic bedrooms and certainly more attractive. Storage abounds in cedar-lined hanging lockers and drawers built into every available space. Additional touches include the chaise lounge beneath the opening portlights and a bureau and writing desk opposite. Again, the finish of the cabinetry and veneers is exceptional and the little touches like internal cupboard lighting go on and on. Moving up and forward into the central companionway is the first of two VIP guest cabins, each with en suite. The first is to port and larger than many 50-footer staterooms. Here you’ll enjoy a king-size bed, bedside tables with lamps, hanging lockers, overhead drawers, flush-mounted TV and entertainment unit. There is under-bed storage for extended voyaging and air-con is standard. 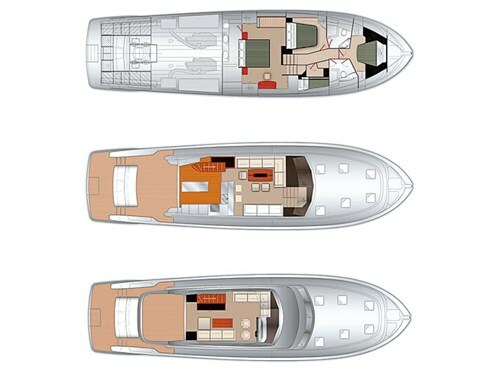 The second VIP cabin in the bow is also large and comfortable, with access to the en suite that doubles as the dayhead. Aft and to starboard is a utility cupboard which, in this case, is home to the Miele washer and dryer. An alternate layout offers this space as a head and shower for the crew cabin (with overhead bunks) alongside and opposite the first VIP cabin. Befitting a motoryacht of this calibre the cockpit and swimplatform are large and beautifully detailed, yet everything is neatly concealed to create a seamless and open expanse. On the lower level is the barbecue, top-loading fridge and freezer and walk-in transom access to the massive aft lazerette. Within is easy servicing of the air-con units and watermaker, not to mention space to burn for toys, fishing gear and other items. The hydraulic swimstep lowers into the water and is a diver’s dream come true, as well as allowing guests in their golden years to enjoy a swim without any fear of getting back on board. Underwater lights are standard and the platform is enclosed from the cockpit with twin stainless steel gates. 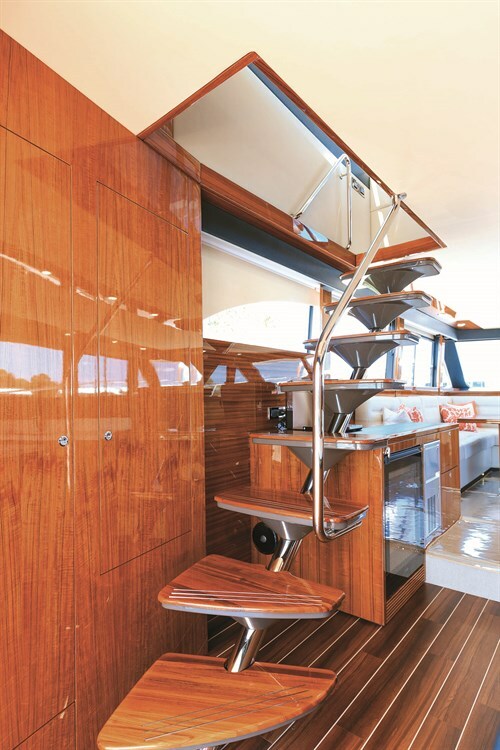 The cockpit is also fitted with an almost full-beam transom lounge and a solid teak table to create the perfect alfresco setting. Underfoot is the hatch that lifts off the sole to provide easy step-down entry into the large engineroom. With walkthrough access between the big Scanias, scheduled servicing will be a breeze. A full eight tonnes heavier than the Maritimo M60 it replaces, the M65 is a solid and surefooted motoryacht and carries the Maritimo legacy for excellent fuel economy achieved through slippery hull design. The solid GRP hull has heaps of buoyancy aft, which in turn provides an early lift and reduced planing speeds for improved efficiency. Fitted with trim tabs as standard and heavy-duty hydraulic steering, the M65 is surprisingly agile and light of foot for her size and stature, rising rapidly to the plane and without pointing her bows to the heavens. Throttle response is positive and light across the rev range and I doubt the level of vibration from the Scanias even put a ripple in our coffee mugs. The fuel figures attest to the relative efficiency at mid-range cruising revs and spirited performance when the taps are opened wide. The Maritimo M65 is a maestro in the truest sense of the word. It is a motoryacht that is as inspirational as it is aspirational and Maritimo owners looking for a step-up in comfort, practicality, easy style and sophistication will find it in the new M65 – a dreamboat by any measure. Twin 900hp Scania DI16 072M marine diesel engines. * Sea-trial data supplied by Maritimo. Fuel burn is for both engines combined and range is based on 10 per cent fuel reserve. 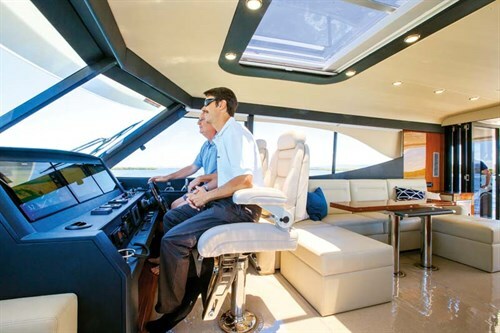 In this video Trade-a-Boat has a first look at the luxurious new Maritimo M65.